It's that time of year when everyone is focused on love ones and looking forward to another year. That's why we're recapping 2016. It's the Most Wonderful Time of the Year - More PTO is Near! Making vacation plans for next year? You'll need our company's 2017 holiday calendar handy. We kicked off 2016 with this newsletter as a way to provide relevant company information that was entertaining and easy to navigate. I hope you found it as informative as I have and are looking forward to our 2017 newsletters. The company-wide newsletter was launched and CEO Chris Walker’s company update was the most read blog that month. His message was the most popular until our PTO quiz came along and nudged him out. Sorry, Chris! It’s hard to compete when PTO is on the line. Our professional growth series was launched in January and parts one and three remained in our top ten most popular blogs all year. We announced the name of our newsletter and blog, The Hub. Then we showed some love when we published Perks that Pay, which has remained the 3rd most read blog this year. March kicked off our first of 10 monthly PTO quizzes and the race to win five days of PTO was on. Coincidentally, the PTO Quiz was the #1 visited blog every month. We also launched our employee promotions & kudos blog, which has been the 2nd most read article this year. With so much info shared in the first quarter, we had a recap. We kicked off our summer road trip series with our team in Alpharetta, GA and this has been the 6th most read blog in 2016. Way to go, ya’ll! Our summer road trip visited the folks in Overland Park and has been the 4th most read blog all year. July was a busy time because we visited three offices – Phoenix, Denver and Bellingham. Who knew the dog days of summer would bring in such a popular contest? Coworkers from all offices submitted photos of their pets and you voted. Jobs 101 was launched and in just three months has become the 5th most read page all year. A guest blog was quite popular in October when 4 simple techniques were shared for successful employee engagement. This was the first month that our PTO Quiz was not number one. What was everyone clicking on? Notes of gratitude from managers. Just goes to show you how valuable a “Thank You” can be. From your work family, we hope all your holiday wishes come true. We kicked off The Hub newsletter and blogs earlier this year as a way to help bridge the gap between our different offices and provide helpful company info to all of our coworkers. Thank you for reading and participating. It’s been a hoot. If you have news you’d like to share with your fellow coworkers, please be sure to contact the marketing and communications team and pitch your story ideas. 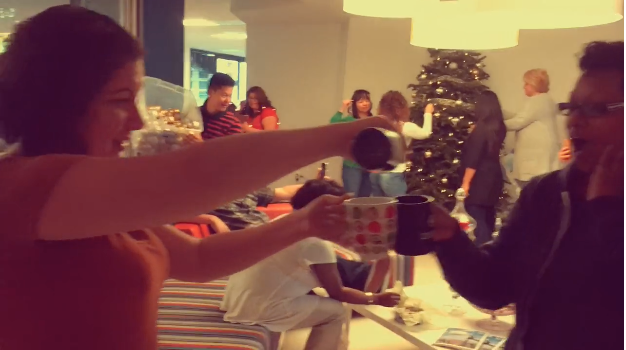 To help get you into the festive holiday spirit, here's a fun #mannequinchallenge video created by the folks in the San Diego office.